No more chalked tires? The system is quietly becoming automated, invisible -- and a big surprise for parking scofflaws. Parking enforcement. Photo by Michael Horne. 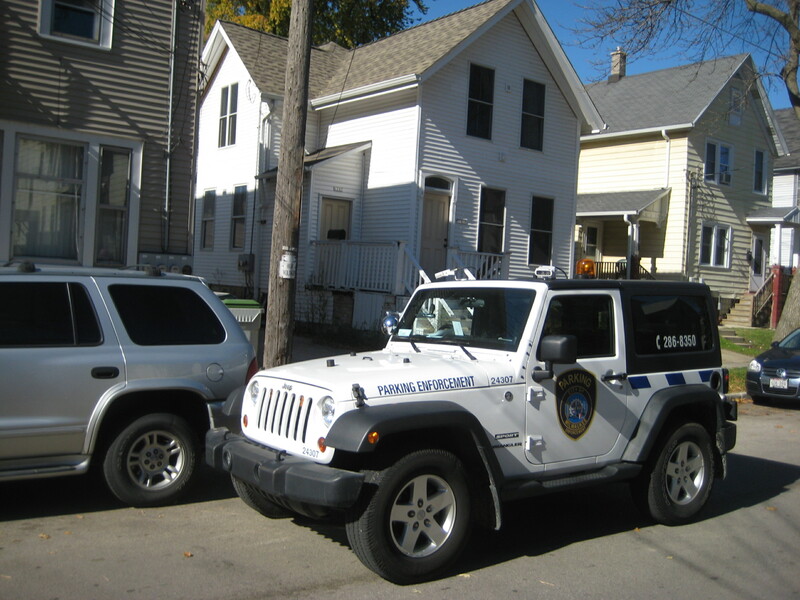 Automated cameras designed to detect night parking permit violators are now also being used to enforce daytime parking, it appears, although a Department of Public Works spokesperson reached Wednesday had no knowledge of the expansion of the program. Traditionally, parking enforcers would apply chalk to the tires of vehicles during an initial pass through a neighborhood. The enforcers would return some time later — usually after two hours or more, the usual parking time limit — and ticket those vehicles which still showed chalk, and therefore had not moved. Errant parkers would then get a ticket. Busted! But a reader, who asked not to be named, confirmed that she had been ticketed twice in the last few weeks for overstaying her time in a non-metered space, and that her tires had not been chalked. The woman, who parks her car near her Lower East Side workplace, would check every couple of hours to see if she had been chalked (if so, she would move the car a few spaces). She noticed that there was indeed a ticket on the windshield, yet no chalk marks were on the tires, one weekday at about 11 a.m., when she got off work. The next time the enforcer rolled around, the woman challenged the ticket. “And that’s when I was shown the photo of my car from over two hours before,” she said. She says she was told that some checkers still use chalk, but that some enforcement is being done by camera. This would appear to be a major change in the city’s parking enforcement. Yet no notice of the expansion of the program was made by the City of Milwaukee Department of Public Works, which manages parking operations. A call to Sandra Rusch Walton, communications director for DPW, elicited the response that the camera-equipped vehicles “were used for the enforcement of night parking” beginning early this year. “Night Parking” hours are enforced, she said, from 10 p.m. to 6 a.m. daily except Sunday. She said she had no knowledge of the expansion, but would investigate the matter and respond when she had further information. According to an April 2013 Business Journal article by Sean Ryan, the city budgeted $700,000 to install the cameras and computers in 34 of its 50 parking checking vehicles. The automated system reads license plates and eliminates the need for night parking permit holders to display permits on their windows. Furthermore, the system also helps flag stolen cars, according to DPW. However, the department never made mention of the expansion of the program to replace the daytime enforcement by chalk line. One might think the addition of this new technology would have been made public in a more prominent fashion. Never mind, we’re happy to provide the warning. Early Voting. Photo by Michael Horne. 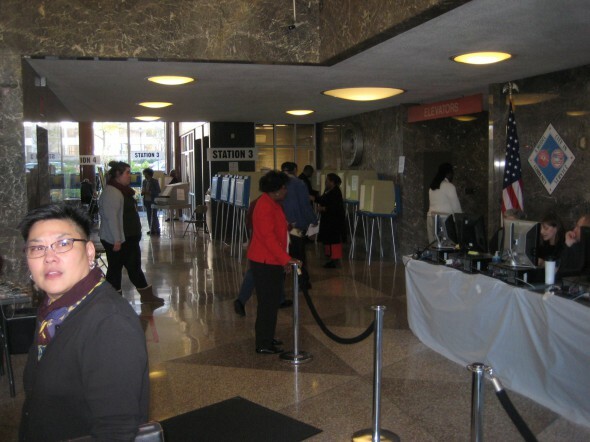 Early voting in Wisconsin ends Friday at 7 p.m. City of Milwaukee residents will find a very efficient operation in the Frank Zeidler Municipal Building. Dozens of election workers very efficiently processed thousands of voters. There are separate entrances for registered and non-registered voters. Workers provide clipboards for filling out ballot envelopes. Clearly labeled stations direct voters to a place to pick up their ballots, stored by ward, and then directed to voting booths to cast their ballots. Finally, the ballots are placed in the envelope, which is initialed by a voting worker and then placed into a bin, awaiting a trip to its appropriate ward, where it will be counted on election day, Tuesday, November 4th. Turnout is considered a key in this election by Republicans and Democrats. It will be interesting to see what percentage of voters in Milwaukee will have voted absentee or early during this off-year election. By the close of day on Tuesday, with three days of early voting left, 8,801 votes had been cast and 1,700 of these were newly registered voters. 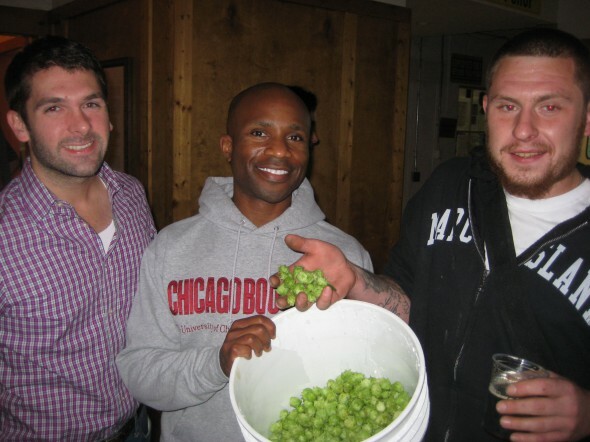 Brett Timmerman and Patrick Awore Mutsune (left) pose at Lakefront Brewery on September 26th with a pail of hops harvested from their home at Kane Commons. Also in the photograph is Joel Franke who harvested the fragrant cones and transported them by bicycle to the brewery just downstream from the E. Kane Place development. The limited-edition “Fixed Gear with East Side Hippy Hops” beer brewed with the hops will be introduced at the brewery on Halloween from 4 to 9:30 p.m.
You are welcome to join me at Lakefront Brewery, 1872 N. Commerce St. on Friday from 4:00 to 9:30 for the introduction of Fixed Gear with East Side Hippy Hops, one of the Specialty Beers series of the brewery. The “Hippy Hops” were grown at Kane Commons, in the 1100 block of E. Kane Place, just upstream and across the river from the brewery. The hops are perhaps the nearest-sourced product yet used in the local-centric brewery’s products thus far. I have no idea where the “hippy” part of the name came from. I planted these hops in 2010 from a cutting made from the mother plant, which grows behind Balzac Wine Bar at the Passeggio on Brady St. As a border that plant does well, but conditions there were not ideal for getting the plant to bud. The site I chose was on the west end of the Kane Commons property, which received abundant light and air. I supported the plant with a wire suspended from the balcony of a home that was for sale at the time. This year, the thing really took off, delighting me and the home’s now-owners, Brett Timmerman and Patrick Awori Mutsune, who expanded the plant’s habitat greatly by having it grow on a horizontal trellis on a stone ledge as well as up the balcony. Joel Franke contacted Lakefront Brewery and the project was a go! We brought down a couple pails of the fragrant buds, and were told to come back when the beer would be ready — which just so happens to be Halloween. We’ll be drinking our share, and you are welcome to yours. The City of Milwaukee could rake in money with traffic cameras placed to detect speeders and traffic light violations. But the most profitable downtown locations aren’t necessarily the most obvious ones (based on 10 years of my rather pedestrian observation). It’s intersections like N. Milwaukee St. from Wells to Juneau where I’ve noticed complete disregard for speed limits and right-hand traffic turns; but not necessarily those same blocks on N. Broadway. Water St. would seem to be a speeder’s haven, but I don’t see that on a regular basis. The “bridge streets”, those critical short blocks between N. Water & N. 3rd St. can be a dangerous place for pedestrians. Then there’s the poorly disguised McKinley Ave. Freeway between the N. Water St. and 6th, and the freeway intersection of E. Michigan and N. Lincoln Memorial Dr. The real revenue spinner would be north and southbound lanes of 6 St. at the intersections of E. Wells, E. Kilbourn & E. State Sts. And there’s the Wisconsin Center Speedway from 4th to 6th (since it’s covered, why not set up bleachers?). There would even be enough revenue for the County Sheriff to schedule unlimited O.T. to collect unpaid violations from around the county. And that’s a good thing. The unnamed woman who used to move her car a few spaces after it was “chalked” won’t be able to do this with photo enforcement. These systems keep track of which cars are parked on which block. If you move the car (but keep it on the same block), the system treats it as a car that hasn’t moved at all (and you will get a ticket).